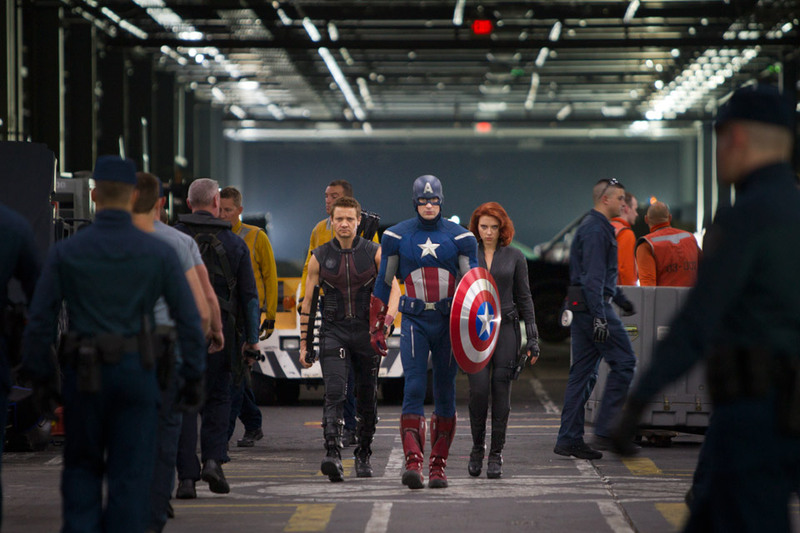 A Cineaste Guest Post: An Extended Analysis of “The Avengers.” | The Cineaste's Lament. ← Daily Trailer: Anchorman 2 – Cheesier! Sexier! Burgundyer! Here’s some of what’s been bouncing around in my head since seeing “The Avengers” last weekend. As it turned out, my thoughts turned out to be … not brief. So I’ve chunked this into three pieces, in the hope of making this a little easier to read. 1) Joss Whedon’s fingerprints were all over that thing, and he might have been one of the only people on the planet who could have pulled off a movie like that. It’s not for nothing that nerds throughout the English-speaking world revere Whedon . First, it’s his ability to take ridiculous, fantastic situations and then populate them with characters that are actually worth caring about. It’s not overthought or overserious (he’s best when he knows his universes are more than a little silly, whether they’re a high school vampire drama or a space western or a bunch of spandex-clad demigods), but it’s not just camp, either. He really cares about these worlds and what happens to the characters who live in them, and that comes through. But what’s maybe most impressive is that the whole film hangs together as a single creator’s vision. It bore almost none of the signs of being written by committee (incoherent characterization, irrelevant side-plots, etc. ); watching the credits at the end revealed why. Whedon co-wrote the story with just one other person; he alone is credited with the dialogue, and he alone is credited as director. It’s simply astonishing that Marvel and Disney and Paramount would have trusted this one guy with such an enormous franchise that’s years and at least four movies in the making; it speaks to remarkable faith in Whedon or maybe extreme desperation — or maybe both. 2) The storyboarding on the fight scenes was remarkable. These days it’s common to see movie fight scenes between just two combatants that descend into incoherence — and this movie had to juggle at least six heroes and an army of bad guys. In both of the big set pieces — Hawkeye’s assault on the Helicarrier and the battle in New York — Whedon’s team of camera people, editors, animators did a bravura job of keeping all that chaos understandable. It was sometimes still disorienting (which can occasionally be the point; you want the viewer to feel the chaos of battle), but at any given minute you had a pretty good sense of what each of the heroes was doing, where he or she was, and how it fit into the larger picture of the battle. Whedon’s team made this look easy, but it truly is a feat to do it this well. This is a bit like damning with faint praise, but I mean it sincerely. I would never expect this to win an Oscar; it didn’t transform the way I view the world. But it did create an immersive world that’s great fun to hang out in. Achieving depth has always been a struggle in comic books. The earliest characters were defined largely by their superpowers (“This one is strong!” “This one wears a magic ring!” “This one … uh, he has a mask!”). One of Stan Lee and Jack Kirby’s key innovations was to define them just as much by their personas — the brainy scientist, the hotshot little brother, the misfit teenager. But the characters were still types (or archetypes), and not so much the kind of fleshed out characters you see in great cinema or literature. Subsequent decades of writers have layered on complexities, but when it comes down to it, the classic comic book characters are always going to run up against the limits of their source material. There are a few comic book movies that have transcended that limitation, almost always by diverging from the source. The Dark Knight posed some really good questions about the nature of order and justice, while Heath Ledger totally inhabited his Joker and terrified us by showing us just how seductive a charismatic madman could be. Tobey McGuire and Sam Rami made us care about a poor loser (no money, no girlfriend, no confidence, no muscles) and asked what would happen to him if his world got turned upside down; Robert Downey Jr. and Jon Favreau asked what it would take to make a superhero out of someone who started out with money and fame and wealth and charisma and questionable morals. But those are, broadly speaking, the exceptions. This entry was posted in action, Comic Book movies, Film Criticism, Film News, Superhero Cinema, The Avengers, Thinking About Movies and tagged Chris Evans, Chris Hemsworth, Joss Whedon, Mark Ruffalo, Samuel L. Jackson, Scarlett Johansson, The Avengers. Bookmark the permalink.